Has a film ever sparked your wanderlust? We’ve compiled a list of 10 South American Films to Watch from the last few decades so you can continue to get your fix of great Spanish speaking films. If you’re enjoying the great films on show as part of the Spanish Film Festival, this list we’ve put together for you includes the greatest films from the last few decades that have been set or created in South America. 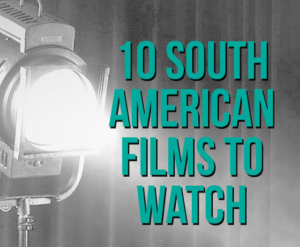 Featuring some favourites plus some well and lesser known titles, these films may inspire you to travel to this unique continent, while others may surprise you with their raw and honest accounts of life within South America. All films on the list however are sure to entertain, amuse and intrigue any lover of great international films. The list is available complete with film trailers to preview or as a list you can keep handy for the next time you are looking for a film to watch. As part of the Spanish Film Festival, we are running a great competition to win $1000 worth of travel credit towards a dream trip of South America. For details, click here.